The first grown-up mysteries I read as a were Sir Arthur Conan Doyle'sSherlock Holmes. 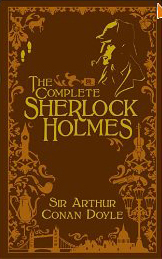 I can't count the number of times I read and re-read The Complete Sherlock Holmes. It's one of the few volumes I am glad to have in hardback, because otherwise I would have had to replace my volumes several times over.